Freedom of religion, freedom of speech, freedom of the press, the right to peaceably assemble and petition the government; these are the five rights granted to us by the First Amendment of the Bill of Rights. It is easy to take these rights for granted, but Constitution Week reminds us how fortunate we are to have them. Constitution Week is an observance to celebrate the rights that we are granted in the United States Constitution. The six media groups on campus: Q30, Montage, Quinnipiac Bobcats Sports Network, Summit Yearbook, WQAQ, and The Quinnipiac Chronicle, have co-sponsored a week of events to bring awareness to Constitution week. 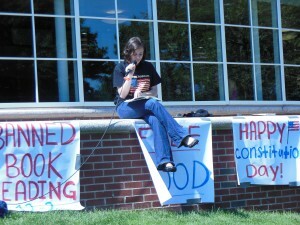 The events included a “Banned Book Reading” on Monday and a conversation with Hamden Mayor Scott Jackson on Tuesday. On Wednesday students are encouraged to vote for freshmen and senior class elections for the Student Government Association. Lastly, the former anchor for ABC World News, Charles Gibson, will be speaking on campus on Thursday. Many of the events incorporate an educational element about the Constitution along with the fun. Monday’s Banned Book Reading included the reading of excerpts from books that were banned from schools like “King & King” by Linda De Haan and Stern Nijland; the story is about a prince who marries another prince. Other books included “The Color Purple” by Alice Walker and “TTYL” by Lauren Myracle. The student media organizations have celebrated Constitution Day for many years, but this year it was decided to have events for the rest of the week. This week of events was also heavily focused on the First Amendment of the Bill of Rights, but this year it was expanded to include topics such as living in a Democratic society and encouraging students to utilize their freedom to vote said Carney. Stickers reading, “Hear us roar. Vote 2012,” will be passed out all week. “The week of events is an important reminder of the rights guaranteed to the U.S., and how different our lifestyle is in comparison to others’,” senior Sarah Winjobi said. Other events including Gibson’s speech, will address the theme of the United States Constitution.